Five cartoons from the pages of The New Republic. It seems an historical accident that The Washington Post op-ed page—home to George F. Will, where Henry Kissinger comes to muse—gave birth to one of the great underground comics. But the legendary curator of that page, Meg Greenfield, had a rare (for an editorialist) streak of adventure that occasionally pointed her in the opposite direction of bow-tied bloviating. And in 1981, she asked The Village Voice cartoonist Mark Alan Stamaty to tell the story of Washington in the age of Ronald Reagan. The qualities that separated Stamaty’s strip, Washingtoon, from, say, Henry Adams’s Democracy, were obvious enough—the visual gags, relentless puns, and general penchant for dada. (Malcolm Frazzle, D.C. correspondent for Dishwasher Monthly, made national news with a scoop from the White House kitchen staff.) But Washingtoon also shared the basic plotline with the short shelf of great Washington novels—the arrival of a parvenu, the seduction of power, the temptations of ambition. For the last 16 years or so, we’ve lost track of Congressman Forehead. Washingtoon has resided in a state of semi-retirement. But with this installment, Forehead returns, older and wiser—which, by the standards of the present-day capital, makes him a Republican lobbyist. His son, Bob Forehead Jr. (known to the world as “Chip”), has assumed his dad’s former congressional seat. The old man, who now works on K Street on behalf of the Glominoid Corporation, views Chip as a younger version of himself—that is, a cipher to be shaped. But Washington and the conservative movement have changed. Chip must maintain the family’s place in the House in the age of the Tea Party—a movement and a moment practically invented to be drawn by Mark Alan Stamaty. This cartoon appeared in the August 11, 2012 issue of the magazine. This cartoon appeared in the September 13, 2012 issue of the magazine. This cartoon appeared in the October 4, 2012 issue of the magazine. This cartoon appeared in the October 25, 2012 issue of the magazine. 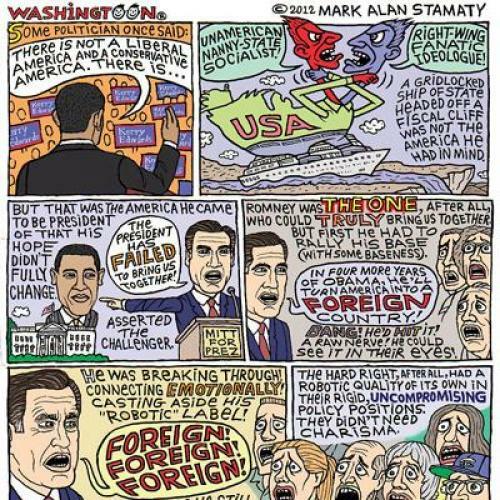 This cartoon appeared in the November 8, 2012 issue of the magazine.